We typically don’t eat much fondue in our house, maybe a couple times a year but in the past few weeks I’ve enjoyed three fondue nights so I thought it must be time to do a little research and write about preparing a delicious fondue at home. One of our fondue nights we prepared at home at the insistence of my youngest daughter Maddie. The other was served to my wife and me at a friend’s house as the pre-meal appetizer. Six of us hung out in the kitchen dipping vegetables, sausage and bread into a pot filled with melted cheese while catching up with a glass of wine. It was a great start to the night. We so enjoyed this fondue, we decided to serve it at our own dinner party the following week. Fondue is the French word for “melted” and is a very traditional Swiss dish made with cheese, wine and seasonings. It is served in a fondue pot also called a “caquelon.” It dates back to the 18th century and is thought to have been created by sheep herdsmen in the alpine regions of Switzerland (Gruyere) who enjoyed dipping pieces of local bread into the melted cheese made with their sheep’s milk. Let me begin by saying I’m sure you don’t need a commercial fondue maker to serve fondue in your home, but it sure helps. I suggest you purchase one if you plan on preparing fondue several times a year. They usually come as a set with all the “stuff” you need for making a tasty fondue including the long skewers used for dipping. Ours fondue maker is electric with a dial to adjust the temperature for melting the cheese and then keeping it a the perfect temperature for dipping. There are non-electric versions that work like serving trays using Sterno underneath to heat the pot but I find it harder to control the temperatures with these models. 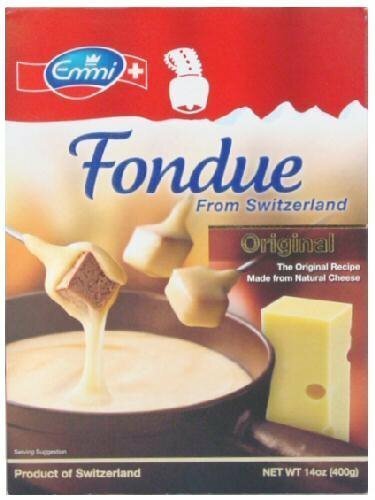 We have prepared fondue from scratch using the recipe below but we also tried a commercial product called Fondue From Switzerland by Emmi and I have to tell you the Fondue From Switzerland is very, very good and much easier to prepare. Is it as good as making it from scratch? Normally I would say no way, but I’ll let you make that decision for yourself. The fondue recipe below is for a classic cheese fondue but you don’t have to stop there. After a quick search on the Internet, I found all sorts of fondue recipes including chocolate, Italian, seafood and vegetarian. There are fondues that are oil based and broth based where you dip meats, chicken or vegetables into the heated liquids. A combination of two cheeses is a must but three cheeses are even better. Shred the cheese before adding to the pot. I made the mistake once of not shredding the cheese and the results were a mess. Bring the cheeses to room temperature before you add it to the pot. This will reduce the amount of time it takes the cheese to melt. Some people melt the cheese in a pot on the stove before adding to the fondue pot. I don’t think this is necessary, but it’s a good suggestion. Don’t overheat the cheese beyond its melting point or it will bind up. The same happens if you let it cool down after it is melted. Keep it at the desired temperature. Start with the wine by bringing it to a simmer before adding the cheese. Good dry white wines for fondue are Sauvignon Blanc, Chenin Blanc, Pinot Blanc, Viognier or Pinot Grigio. Don’t use cheap wine. If you wouldn’t drink it, don’t cook with it. A tablespoon of kirsch (cherry brandy) can give you fondue added layer of flavor. Add it after the cheese is melted. Most classic fondue recipes call for white wine but if you decide to go alcohol free, try substituting milk for the wine but you need an acid like lemon juice. Try 2 tablespoons of lemon juice to 1 cup of milk. You can substitute apple cider for wine too. Use a thickener like cornstarch to thicken and stabilize the sauce. Try adding it to the wine to dissolve before adding the cheese. Invite great friends to share your fondue with you. Lots of dipping ingredients like cubed French bread, parboiled potatoes, sausage, apples, and blanched or steamed vegetables including carrots, cauliflower or broccoli. Add the wine and lemon juice to the fondue pot and bring to a simmer. Add the cornstarch and stir to blend. Add the cheese in small handfuls while constantly stirring until the cheese combines with the wine and melts. Do not stop stirring and do not let the cheese come to a boil. Simmer only, folks. When all the cheese is added and melted into a creamy substance, add the pinch of nutmeg and a little freshly ground pepper. Now give yourself 30 seconds to rest your arm before serving with all the prepped dipping ingredients. If you don’t have enough “fondue forks” try using wooden skewers. They make great substitutes. Hi Prada, you can get everything ready to go, but I don’t see any time saving from pre making it and then reheating it later. Don’t think it would work either. Hi Prada, there are three cheeses in my recipe – Gruyere, Emmentaler, & Jarlsberg. I’m sure you could experiment with other cheeses similar to these. If you do try some other cheeses, please come back and let me know your results. Good luck.